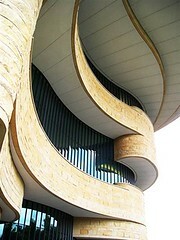 Inspired by the NMAI, I used canyon colors and windswept shapes. Straight line quilting on the strata fabrics and squash blossoms in the sunlit sections. 15"x24" The whole piece is freezer paper applique' and made in Sycamore, IL - far from the southwest, to be sure, but when the snow flies very much on my mind!! Growing up just moments from Washington, D.C. 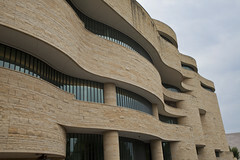 I chose to glean my inspiration for this challenge from the Museum of the American Indian, a newer museum on the National Mall. (As an aside, this is a FREE museum, that is not only architecturally beautiful on both the outside and the inside, but also offers a whole host of programs, exhibits and videos.). While the building is basically two –toned (the sandy exterior and the blue glass windows), I wanted to make this colorful using colors I found in nature. I first wanted to make the windows. The straight lines are in such stark contrast to the contours of the floors and ceilings. Once I made the windows (adjusting in size as the move left to right a bit to add depth), I then added the plum colored “floors” that flow across the pane. 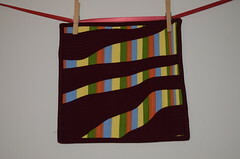 Finished, this is 12x11.5 inch wall hanging. Wonder, who's burning the midnight oil tonight? Looks like five offices are lit up, while the rest of the world sleeps. Notice, the clock has struck midnight. 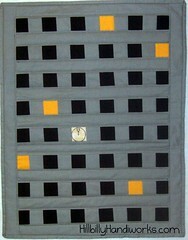 My quilt is 18 1/2" by 24". I am from Cameron, Mo. 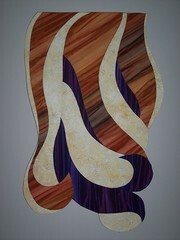 My entry into Challenge 1 of Project Quilting's new season. I just love the symmetry of the door, even the knob itself is centered on the front. 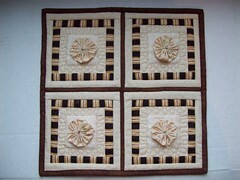 The quilt measures 10 by 12 inches. 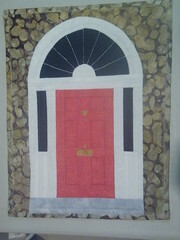 I call it The Red Door - Inspiration was a photo in a book about Ireland and its people. 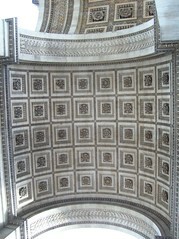 The whole page was covered with photos of similar doors and it struck me that it would make a nice quilt. 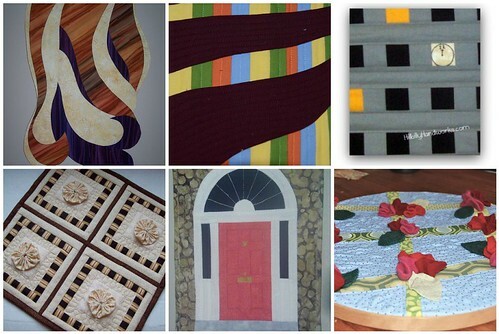 so.... we were challenged this week to design a quilted entry with architectural inspiration. We were also encouraged to "think outside the box"....so, I attempted to do both! and.... 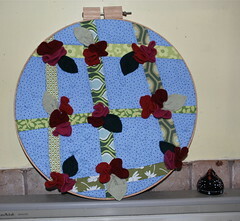 I got thinking about the challenge to "think outside the box" which led me to design a piece that was quilted but not displayed as a traditional quilted piece might be but rather displayed in a large wooden hoop, as might be used for hand quilting. I also wanted to incorporate some textural elements which led me to the 3D felted wool flowers that are "growing" on the lattice. This challenge led to a little lose of sleep as I thought about how I wanted to approach it but in the end I was very pleased with what I came up with - though I think it will be quite different from most of the other entries! Did you miss the first closer look? 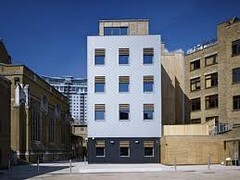 So interesting that two quilters picked the same building, and interesting how different they interpreted it. This is really nice - just a few at a time to see all of the wonderful projects! 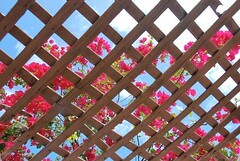 I love seeing the architectural inspiration behind the quilting project.